Hi friends! 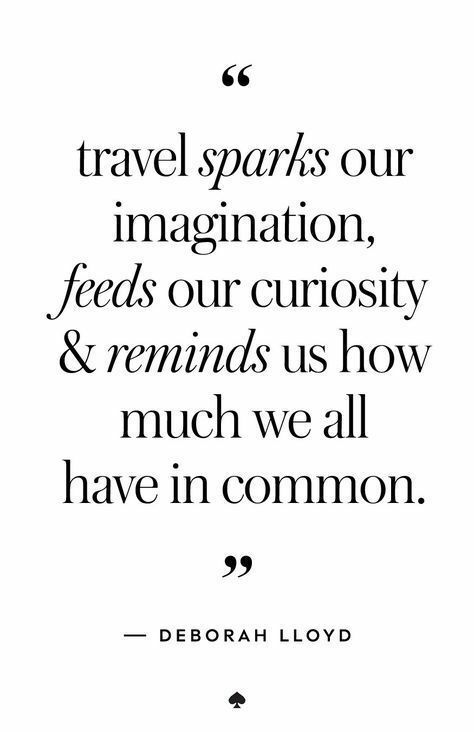 I am so excited to get back to blogging today (exams are over! 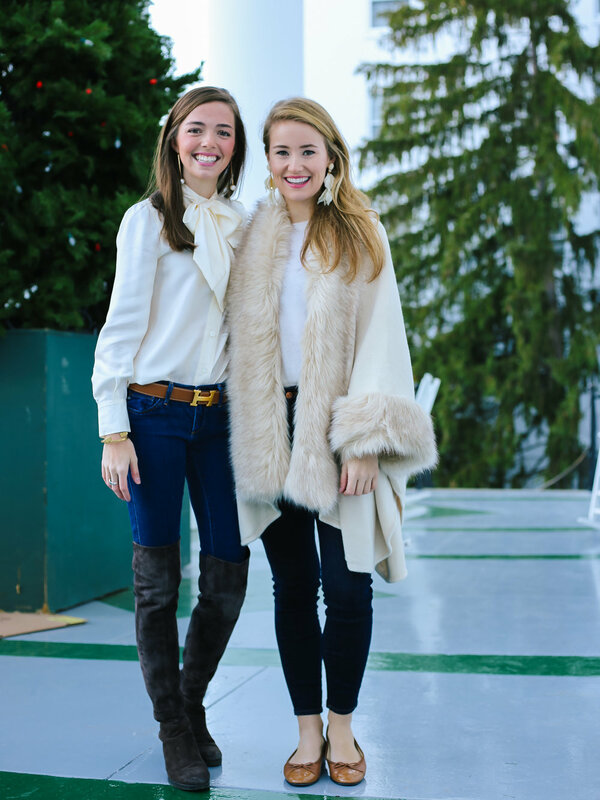 ðŸŽ‰) and so happy to share more of one of my favorite trips of the year to The Greenbrier Resort with you! 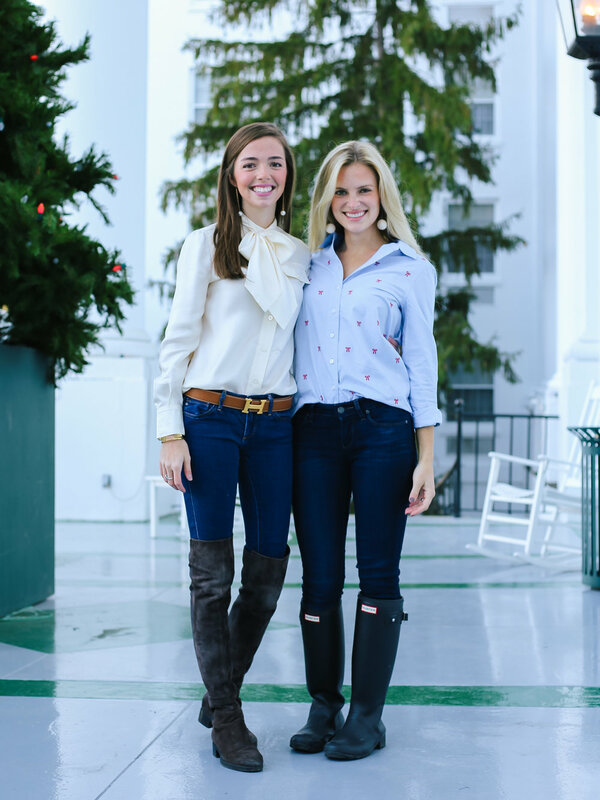 A couple weeks ago, Kate of Lonestar Southern, Elisabeth of Elisabeth and Butter, and I had the amazing opportunity to venture up to my favorite resort, The Greenbrier, to kick off the Christmas season and take part in some of the fun things happening at the resort this winter! 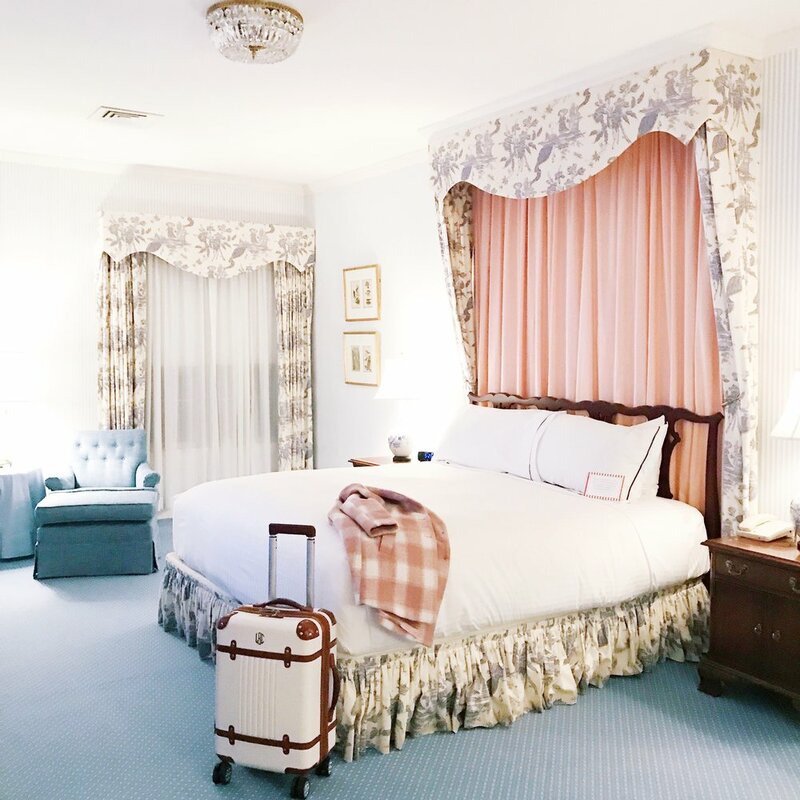 Because there is SO much to share (lots of outfits, activities, and events), I have decided to recap our trip day by day, so this post is a little "virtual journal" of days one and two at The Greenbrier. I have included my outfits and some of my favorite events/activities below. 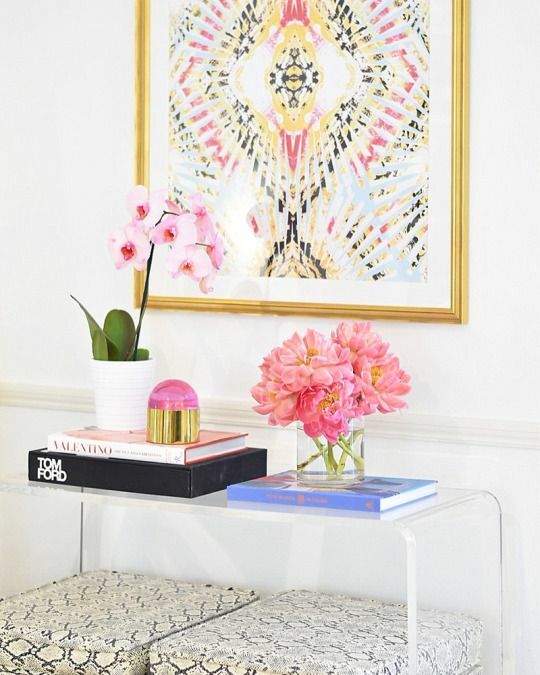 I'll be sharing more posts rounding up days three and four, so stay tuned for more! Travel outfits should always be a blend of comfort and style, balancing function and fashion. For my early morning flight to The Greenbrier, I wore these amazingly versatile and comfortable leggings, an oversized sweater, and this pretty pink coat. I carried on my favorite travel bag and wore a comfy pair of flats that I could easily slip on/off for security. To get to The Greenbrier, we flew into Roanoke airport, which is about an hour and a half drive to the hotel. Our drive flew by and we had the best time chatting and getting to know our amazing driver Keith! He was the best. FYI, this spring there will be a few new flights operating out of Greenbrier Valley Airport (about a 15 minute drive from the resort), so be sure to check that out if you are planning a trip soon! 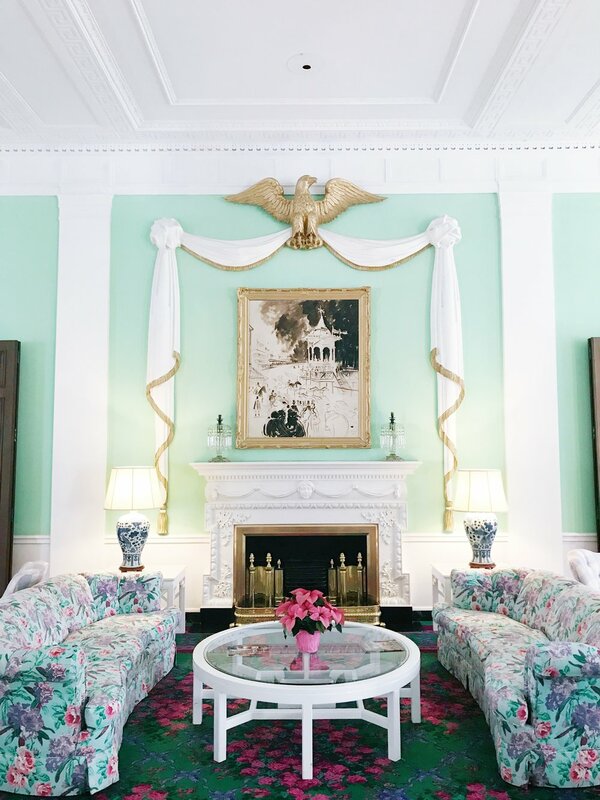 There is simply nothing as grand as rounding the corner from the main gate of the Greenbrier to the hotel and seeing the stunning sight of the hotel. It blows me away every time! It is so huge and so beautiful- it's almost impossible to take it all in. As soon as we walked through the doors to check in, the same familiar smells and friendly faces (that have come to feel like home and family over the past 13 years) gave us the warmest welcome. We knew from the minute we arrived, we were in for a pretty special few days! The hotel is already so beautiful, but there is something really magical about it during the Christmas and winter seasons. The roaring fire places, the hallways decked out in holiday greenery, and pretty red bows around every corner make the hotel so happy and cheerful this time of year! After checking in at the hotel, we were given the keys to our beautiful home for the weekend- Top Notch Estate House. As we drove up the hill to the house and entered the front door, our jaws dropped. 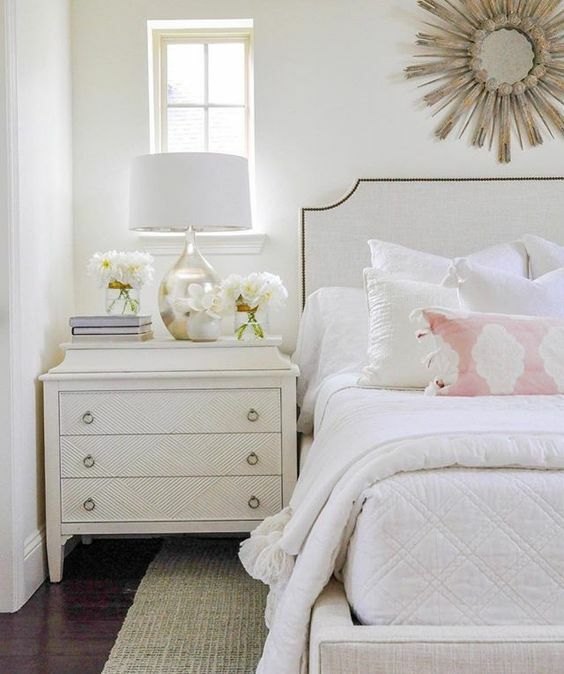 We instantly fell in love with this amazing home and felt like princesses all weekend long. The floral draperies, the striped wallpaper, the giant bathrooms and closets, the stunning dining room, the beautiful fireplaces... I could go on for hours about how wonderful this home is! It was a dream to stay at Top Notch and we made the most of every minute of it! Our first full day at The Greenbrier was a very happy one. The first morning we woke up to the cool mountain morning air and walked down the steps from our cottage to the hotel and made our way to the delicious breakfast buffet in the Main Dining Room. We stopped on the balcony overlooking the North Entrance of the hotel (one of my favorite views) to snap a few outfit pictures before breakfast. The temperatures were comfortably in the 50's this day, so I paired this bow blouse with these jeans and layered on my Barbour jacket for a little extra warmth! 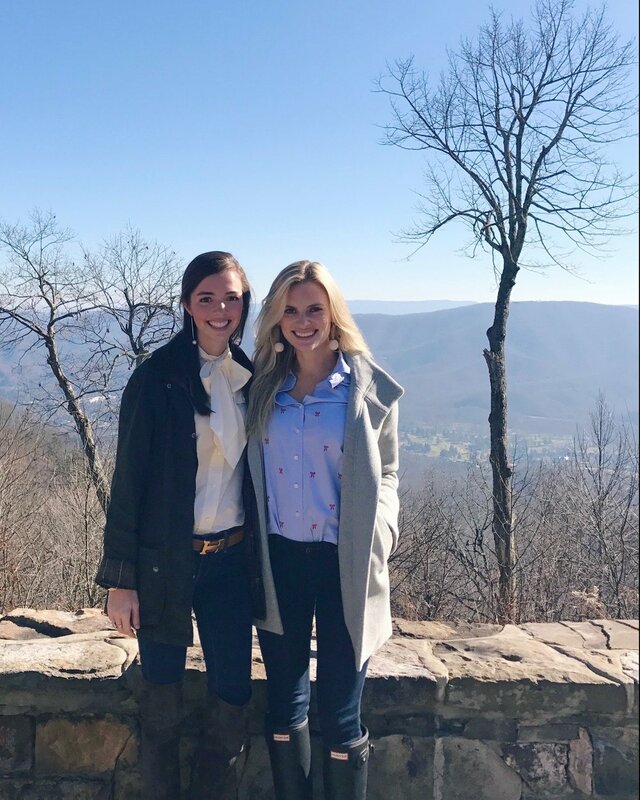 After our yummy breakfast, we headed out for a real estate tour of The Greenbrier Sporting Club and got a peek at some of the amazing amenities The Greenbrier offers to its homeowners an Sporting Club members. This was such a fun way to start off our day and get a feel of the expansive and beautiful Greenbrier property. From resort homes, to creekside homes, to golf course homes, to mountain homes, the Greenbrier has something for everyone. My favorite part of the tour was venturing up the mountain to the Summit Club and looking over the valley and seeing the resort from above. It's breathtaking! 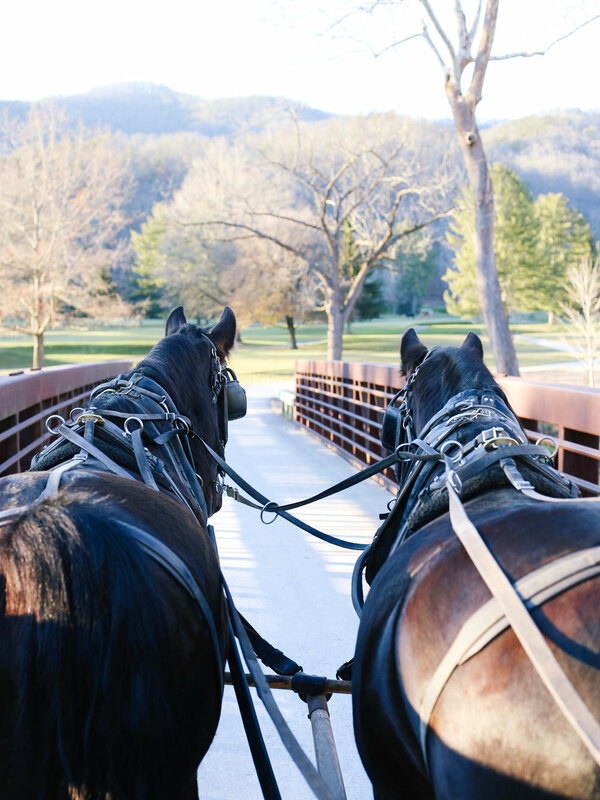 One of my favorite things we did at The Greenbrier was go on an afternoon carriage ride. It is easily one of the best ways to see the resort, the golf courses, and more of the Greenbrier property. The views around every turn get prettier and prettier! The temperatures were getting a little cooler as the sun began to set, but we bundled up and stayed warm with the cozy carriage blankets! Friday's dinner outfit may have been one of my favorites from the trip! 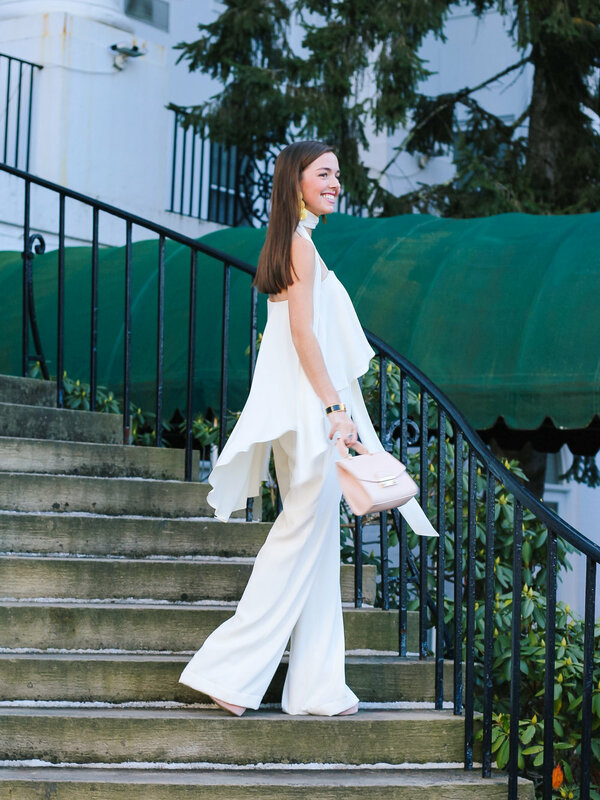 I wore this winter white jumpsuit with gold statement earrings (similar) and added few subtle pops of blush- these heels and this bag. This jumpsuit truly feels like wearing pajamas- the silk fabric is so soft and flows beautifully. 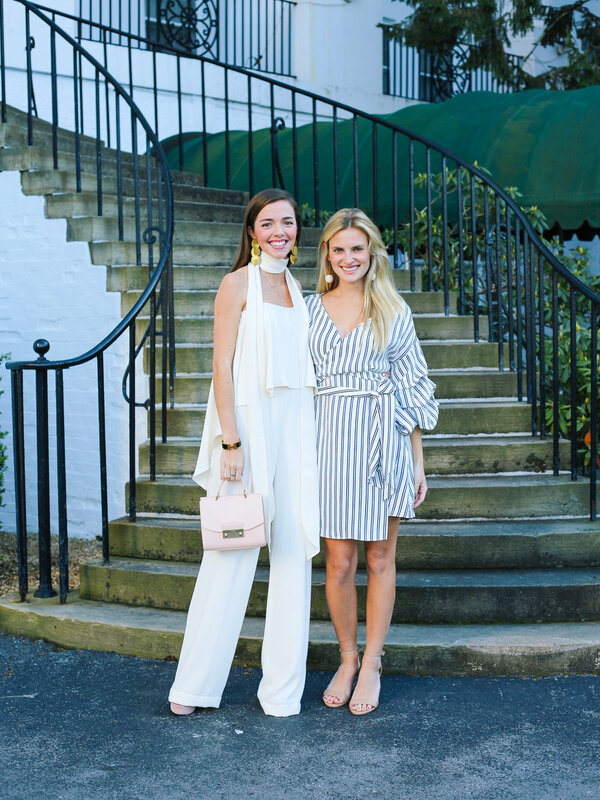 I love all the little details of the jumpsuit- the elegant neck tie (that can also be worn as a belt), the gorgeous ruffle back panel, and the pretty pleats in the pants all make it a really timeless and beautiful piece that I know I'll be wearing again and again. Day two at The Greenbrier ended with a delicious dinner at The Forum. 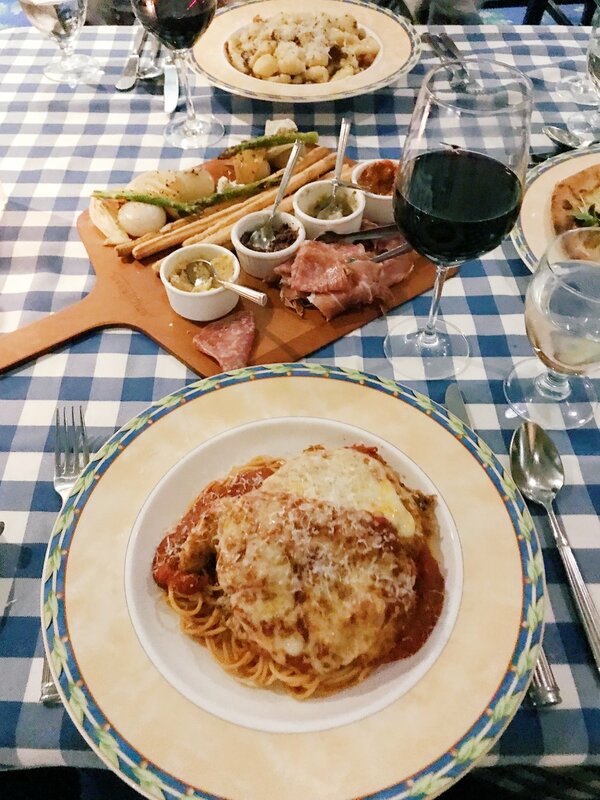 We had the best meal and dined on the yummiest pizzas and pastas. We went to bed with extremely happy hearts and happy stomachs, looking forward to all that day three would hold for us!